The fastest way to build a website is to use a readymade website template, plus do some customization (depending on your requirements). And when a few years ago that was the choice of small companies and bloggers, today even the largest corporations opt for these tactics. Indeed, why reinvent the wheel if you can use the achievements of hundreds of professionals for a nominal price? Today we are pleased to introduce you to one of the most promising web-design products of 2016 – an ultimate HTML5 template dubbed Intense. 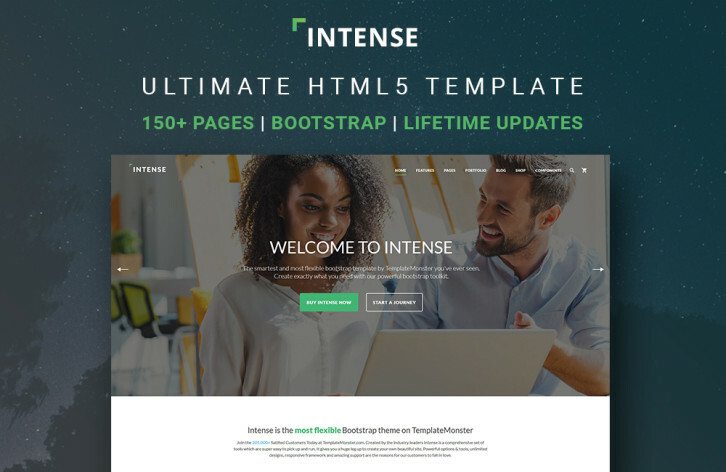 In general, Intense is a multipurpose HTML5 website template with hundreds of readymade pages, but it’s too versatile to be given a precise definition. It was conceived as a one-stop solution, and that’s why it is jam-packed with pages, design components and plugins. And since it’s a pure HTML template, and not a CMS theme, you can easily pick only the elements you need for your current project without digging into the code too deeply. That’s why Intense can grow exponentially, but remain convenient and easy-to-use at the same time. Granted, it would be nice to reach your hand into a bottomless bag and pull out a dozen or two of the ready-to-use design elements – unconditionally, at no additional cost. 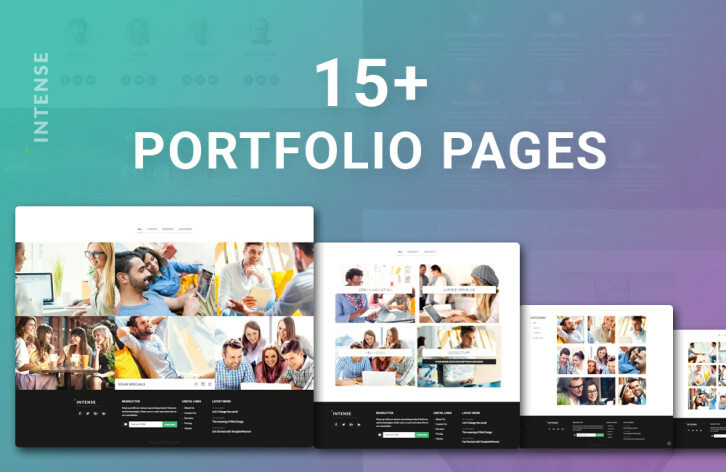 The gallery of pages is the core part of Intense comprising 150+ predesigned layouts. It meets the needs of the widest range of clients: bloggers, business owners, artists, online sellers, and many others. 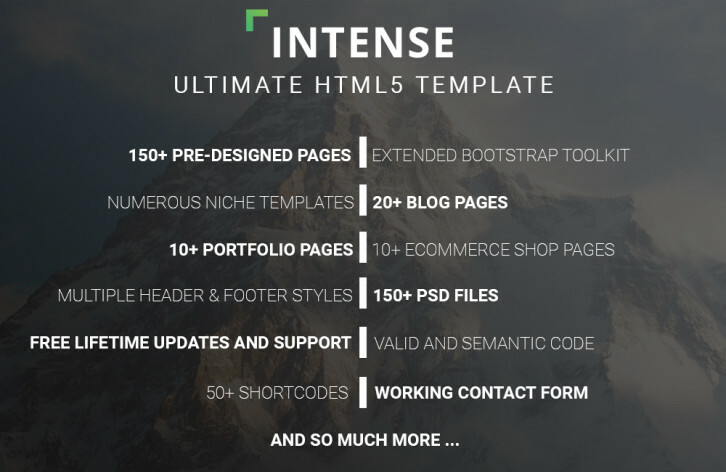 Intense comes with a broad choice of blog layouts including grid, masonry grid, wide, events, timeline and other styles. And each layout is available with no sidebar, left sidebar, right sidebar and both sidebars. 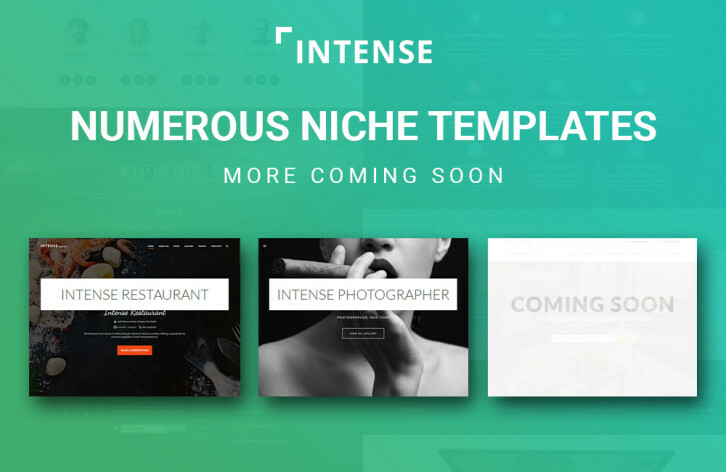 Intense is the HTML5 template that offers multiple gallery pages for photographers, designers and other artists. The available options are: Grid Layout (Horizontal, Vertical), Masonry Layout (Horizontal, Vertical), Wide Layout (Horizontal, Vertical), Full-Width Layout (3 columns, 4, columns, 5 columns), 6 Custom Effects, Single Project. 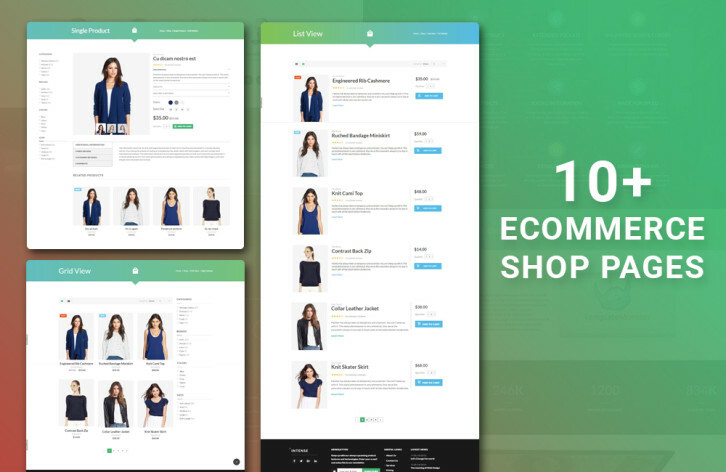 Intense is a perfect solution for building eCommerce websites. The template has various layouts for online stores: store front pages, catalogues, product pages, and so on. Besides those, there are a lot of specific-purpose pages, which are universal, and can be applied to any website: Services, About Us, Contact Us, 404, etc. The total number of layouts exceeds 150 in the release version. They have been designed with great attention to detail. For example, when you put the cursor on the newsletter form the “Enter your Email” inscription moves to the top of this form instead of just disappearing, thus giving you an idea about the purpose of the field you are filling in. This will be especially useful in complex forms with many fields (such as user registration). There are lots of such small details, which invisibly improve usability. Aside from the main template you will be granted access to a number of standalone templates, which share the common approach to coding and structure, but can be used separately from Intense itself. At the time of the release there are two such child themes: Intense Restaurant and Intense Photographer Portfolio. If you already own Intense, don’t forget to check regularly the child template page for updates in order not to miss out on new free designs. And now the fun part for those who like to unwrap Christmas gifts – Intense will be regularly complemented with new resources. In addition to the existing content you will receive new pages, design elements and child templates. If you have purchased a license, you will be able to download them for free. But not only the content updates are lifetime – the support is too. You can contact the support team anytime, 24/7, and get expert help in no time at all. 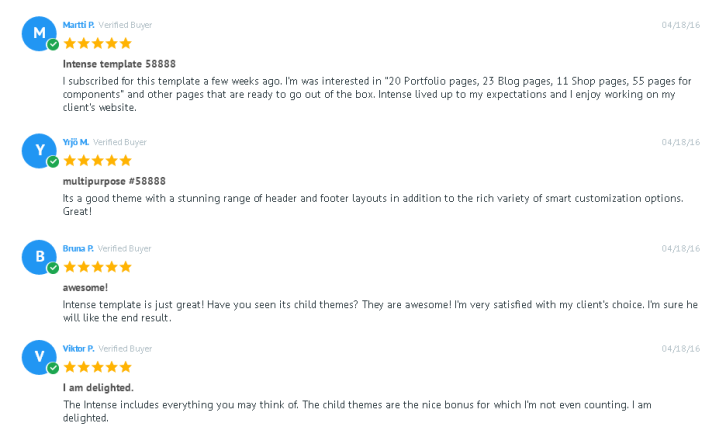 It happens that you like the design of a template, but you are not satisfied with the style of its header. With Intense it’s not a problem anymore, as you are free to choose from 20+ header designs, and combine them with any of the preferred body layouts. Although footers are not as visible as headers, they often contribute significantly to usability of a website. 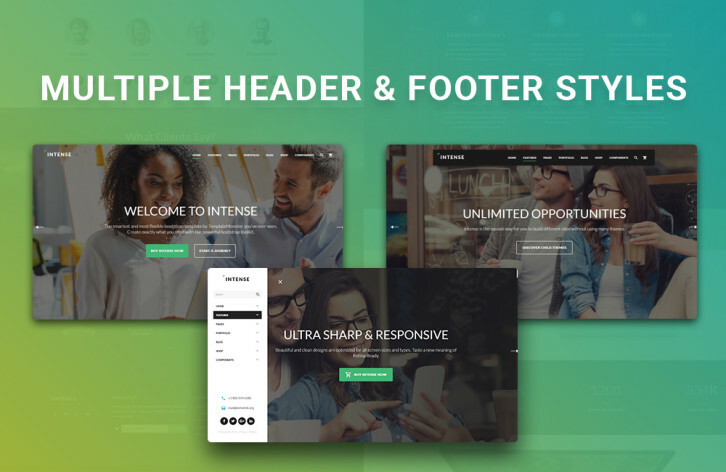 Intense includes 10 completely different footer layouts – from simple one-liners to complicated mega footers with multiple columns, incorporated forms and social widgets. Intense is built with Bootstrap, but is not limited thereto. 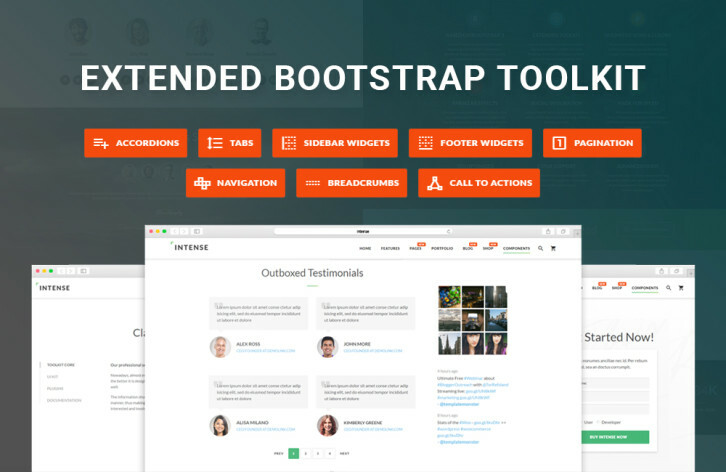 It includes a development kit called “Extended Bootstrap Toolkit” with hundreds of components not presented in the vanilla Bootstrap: elements for infographics, dividers, buttons, pricing tables, testimonials, and many more. To see them all open the live demo and click the “Components” menu tab. 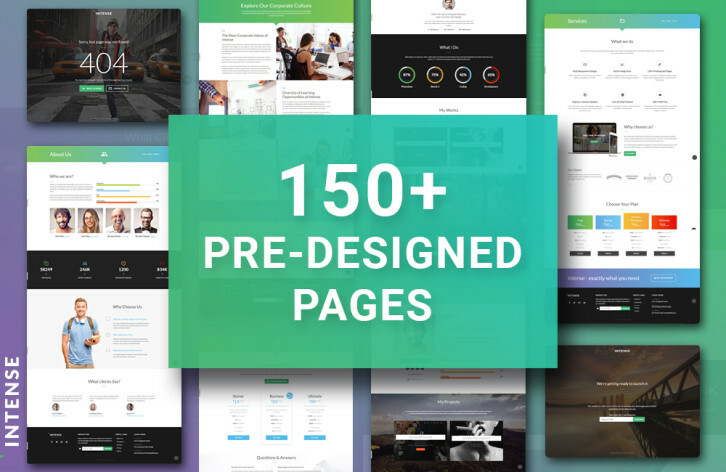 The starter pack includes 150+ layered PSD files, which, together, constitute one of the most impressive UI kits in web design history. With each content update this set will be growing by the number of new HTML pages released. What modern website can do without integration with social networks? The answer is “not a website made with Intense”. This template offers you 4 plugins for dynamic and tunable displaying of your social feed from the most popular networks – Facebook, Twitter, Flickr and Instagram. The integration is powered by the original plugins created with the official APIs of these social networks. If we are talking about plugins, it’s worth noting that their range is not limited to social widgets. The initial release also features the Event Calendar and the Newsletter Form. A total of 20 plugins are planned. If you are planning to use audio and video content in your website, you should know that it is possible to implement it more easily via the RD Audio and RD Video extensions, which are exclusive to Intense as well. Intense seems to be a good investment. If you are a web-designer, it will supply you with high-quality website components; if you are a website owner, you will save a lot of money on the development process. 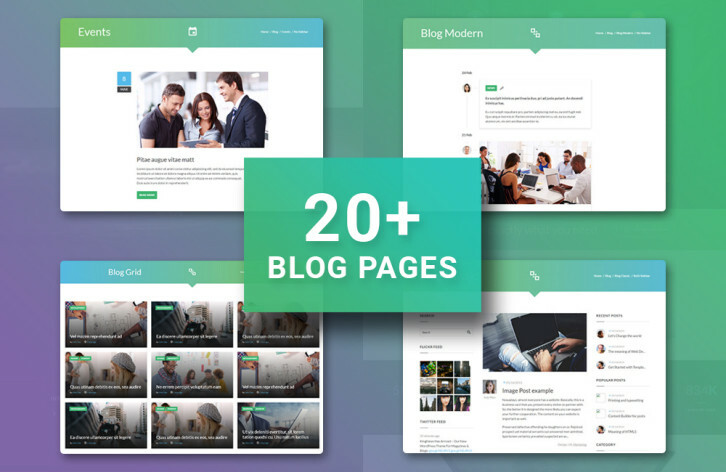 Moreover, this huge package will also grow over time, providing you with more new pages, child themes and other features. Just give it a try and see for yourself!